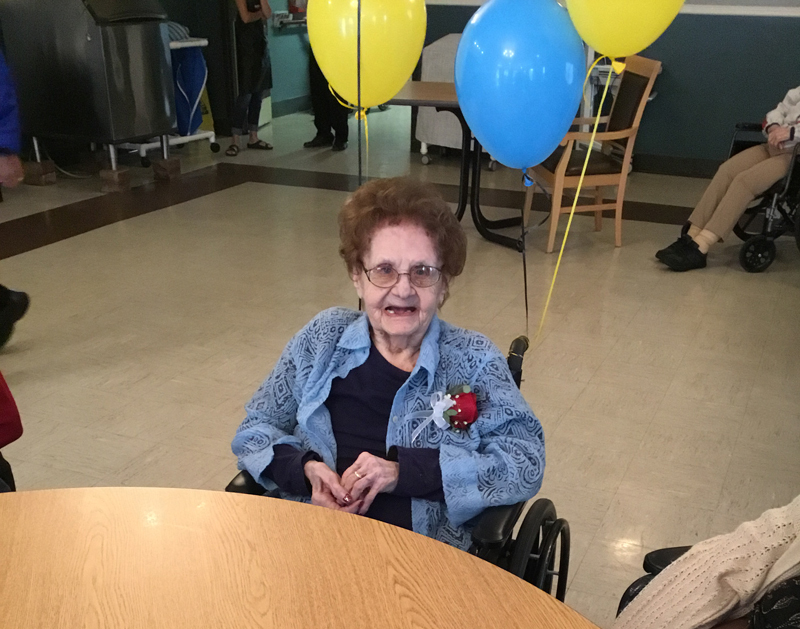 Courtesy photo Gladys Barron recently celebrated her 100th birthday. She was born on Aug. 29, 1918 in Mathias Township, Mich. She married Loren Barron on Oct. 19, 1940. Gladys and Loren had four children, Cherryl, Jimmy, Raymond and Diane. Raymond and Diane have since passed away. Her favorite things to do now are socialize, have hot chocolate, tell a joke, sing along, and play bingo. She didn't seem too thrilled to find out that she was 100. Above is a photo from her 100th birthday, which also happened to fall on the resident birthday party at Christian Park Village. Gladys Barron recently celebrated her 100th birthday. She was born on Aug. 29, 1918 in Mathias Township, Mich. She married Loren Barron on Oct. 19, 1940. Gladys and Loren had four children, Cherryl, Jimmy, Raymond and Diane. Raymond and Diane have since passed away. Her favorite things to do now are socialize, have hot chocolate, tell a joke, sing along, and play bingo. She didn’t seem too thrilled to find out that she was 100. Above is a photo from her 100th birthday, which also happened to fall on the resident birthday party at Christian Park Village.